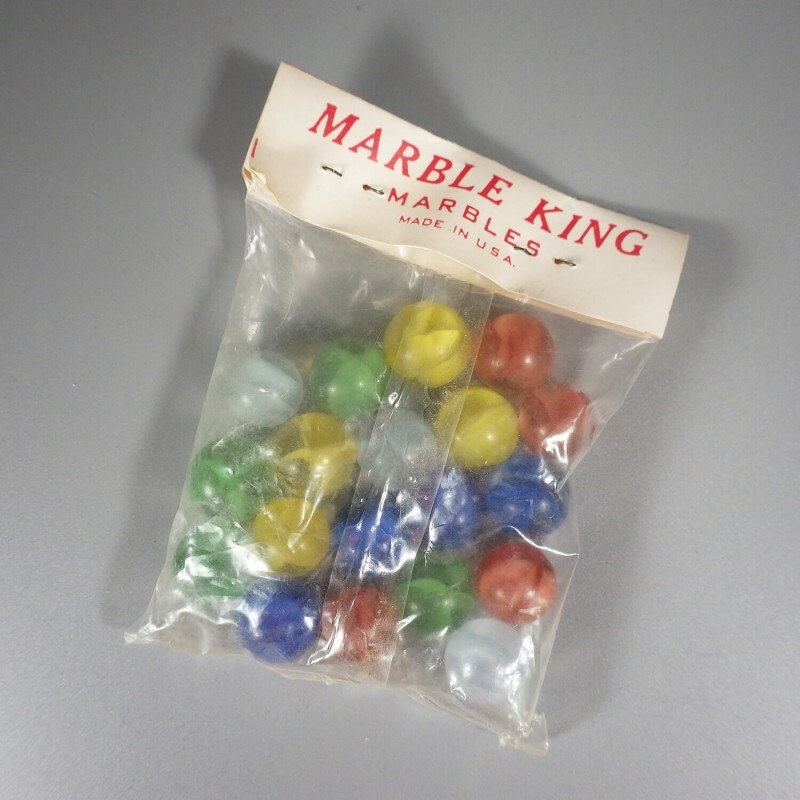 For your vintage marble collection, a set of 19 multi-colored cat's eye Marble King vintage marbles, with colors of blue, yellow, green, peachy orange and white. 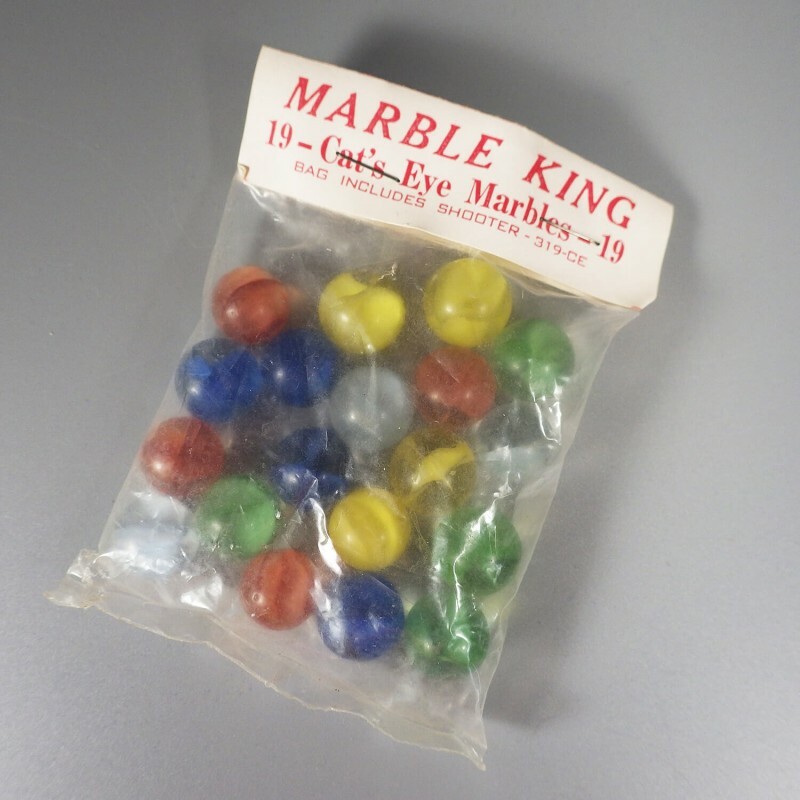 This set of Marble King cat eyes is believed to date to around the 1960s, still in the original unopened bag. The bag label indicates that the "bag includes shooter 319-CE," however, all 19 marbles appear to be of the same size (16mm). The bag plastic has dulled with age and there is one corner with a few snags, but no indication this bag has ever been opened. Avid collectors will find other vintage marbles featured below. A large (22 mm) vintage Czech marble with swirling thin yellow and red frosted stripes coming around..
Another Peltier beauty, this one with a split of white foamy waves across its transparent base and a..
For your vintage marble collection, a set of 19 multi-colored cat's eye Marble King vintage marbles,.. In as-made mint condition, this eye-catching marble is a Ravenswood swirl in three colors - white, c..
Akro Popeye corkscrew marble in a blue, yellow, and white corkscrew banding, with the blue being wid..
Akro Agate carnelian corkscrew marble, with a translucent vaseline-colored base wrapped in a wispy c..
Akro Agate Popeye corkscrew marble in a yellow, green, and white corkscrew banding, with a transpare..
Akro Agate corkscrew marble with a milky white base wrapped in a tart yellow spiral band. Size: 16 m..
One of my favorites (I love red! ), this Akro corkscrew marble has an opaque base with a translucent ..
Coming from the same estate, two pair of vintage marbles -- with each pair or set consisting of a 5/..
Fabulous Champion Agate three-color swirl marble in an opaque white, burnt orange, and mint green, t..
A yummy vintage Akro Agate Prize Name corkscrew marble with a bright yellow base and a deep red, som..
Offering a lot of 9 vintage banana cateye marbles, believed to have been made by Peltier. Included a..
Beautiful Peltier NLR Panda with an opaque black base that is striped with four ribbons of white bet..
Fabulous Peltier NLR Blue Panda with a deep blue base striped with four ribbons of white between two..
A lovely Peltier Sunset Rainbo, with its transparent base just sparkling with tiny bubbles and wrapp..